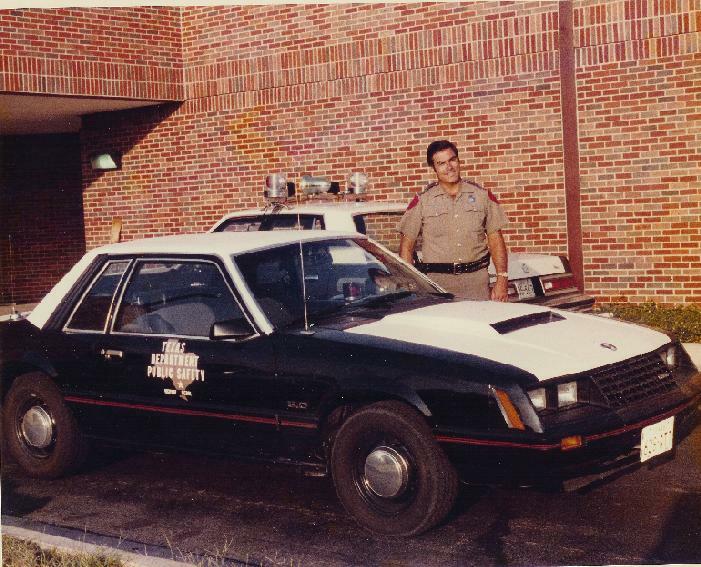 Trooper Dwayne Pruett standing next to a 1982 Mustang provided to DPS for testing. Tpr. Pruett helped evaluate the car and liked it so much that he bought a '82 GT after sending it back to Ford. Photo courtesy of D. Pruett. 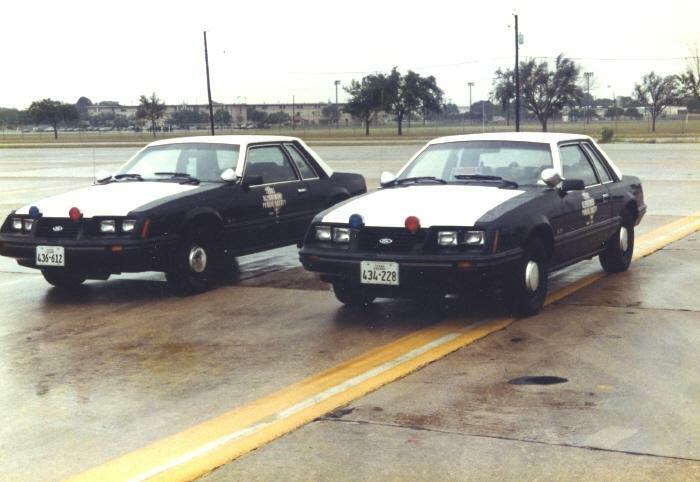 1983 (right) and 1984 (left) DPS Mustangs. DPS Photo, courtesy of T. Scharp. 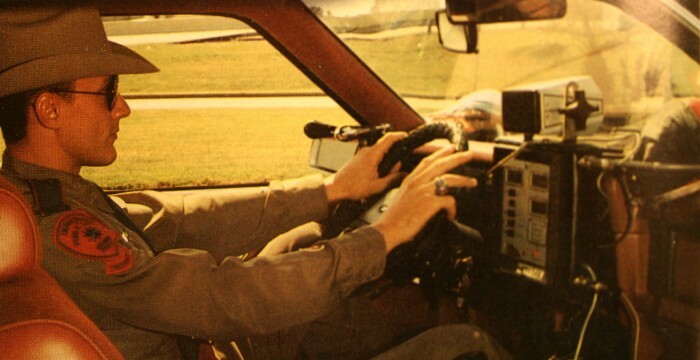 Interior shot of an '83, showing the GE radio head, Federal PA200 siren, and MPH S-80 radar. Photo courtesy of T. Scharp. 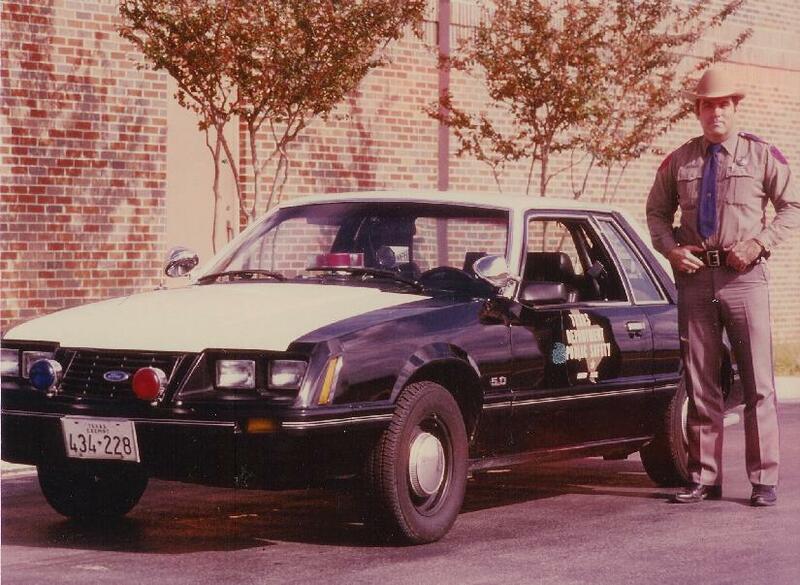 Another '83, assigned to Trooper Dwayne Pruett. Nice shot of the PAR36 front halogen flashers, Whelen Responder dash light, and MPH radar antenna. Photo courtesy of D. Pruett. 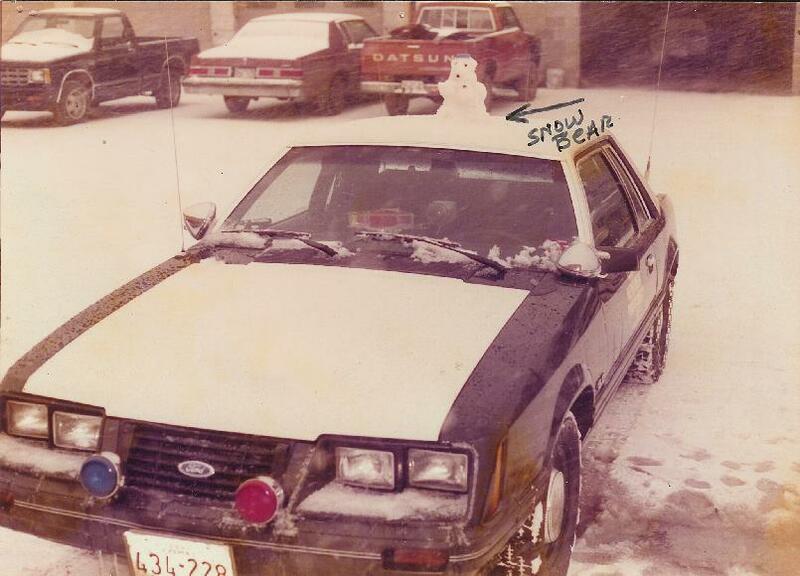 Another shot of the '83 Mustang assigned to Trooper Pruett, in the snow. Photo courtesy of D. Pruett. 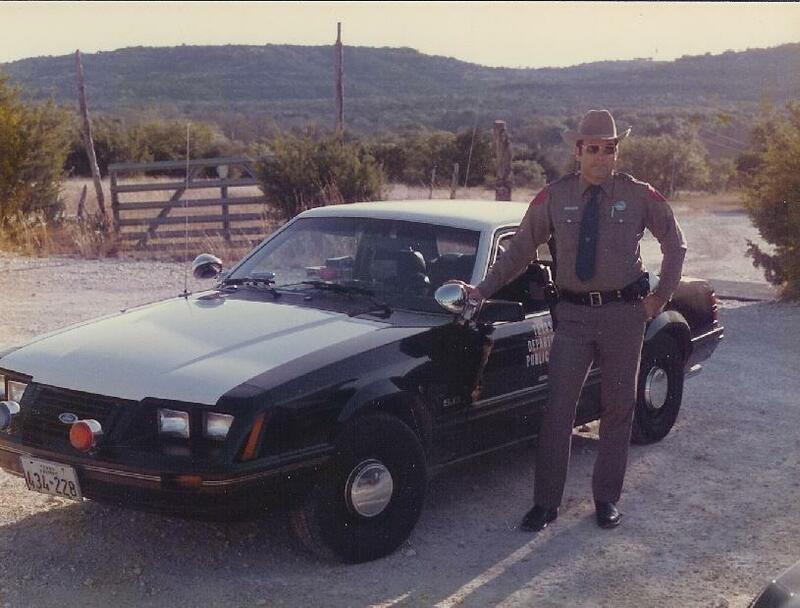 Trooper Pruett and his 1983 Mustang. Photo courtesy of D. Pruett. 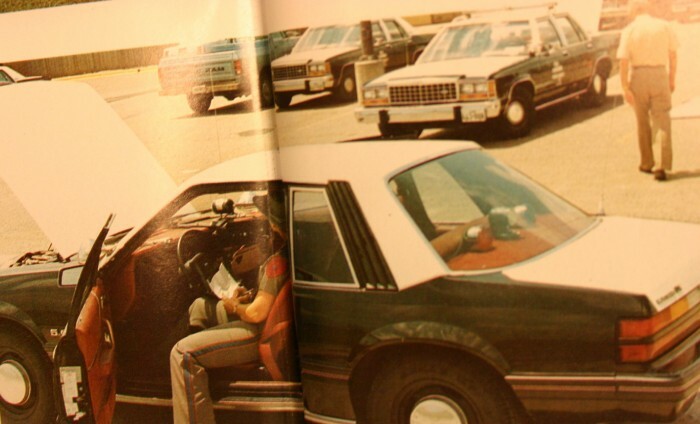 A pair of 1983 Mustangs, including the one pictured above. Some Troopers moved these front lights down a bit so that they wouldn't be illuminated against the white background of the hood. Image courtesy of R. Collins. 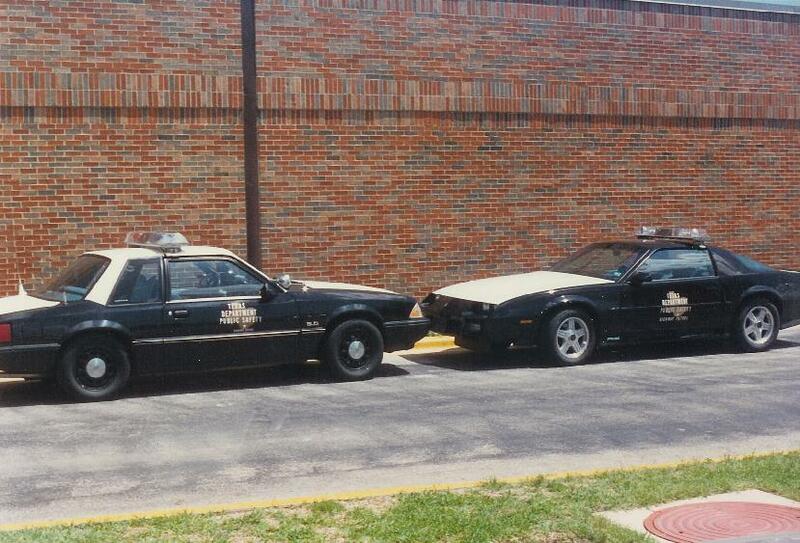 Another pair of 1983 Mustangs, including Tpr. Pruett's. Image courtesy of D. Pruett. 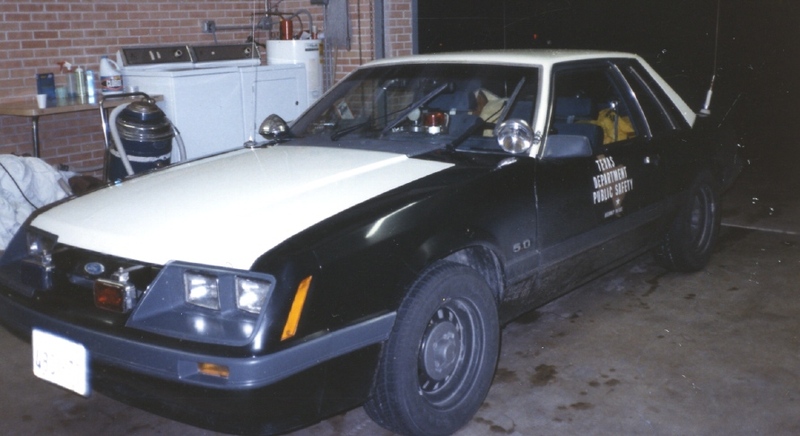 1984 DPS Mustang, showing the same lights on the deck as up front. DPS Photo, courtesy of T. Scharp. 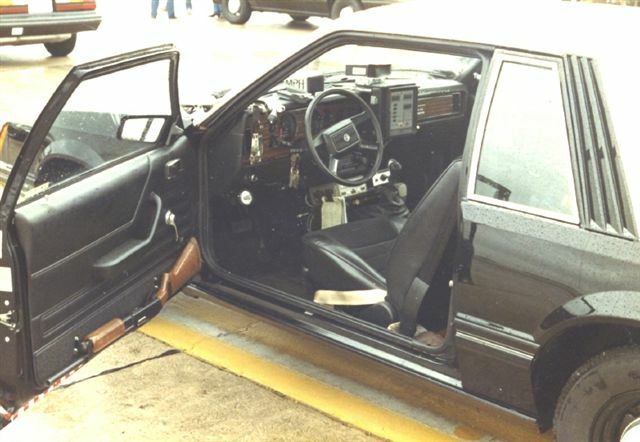 1984 DPS Mustang interior. DPS ordered red inside for 1984 (black was no longer available), and ordered many later Mustangs in a variety of interior colors. DPS Photo, courtesy of T. Scharp. 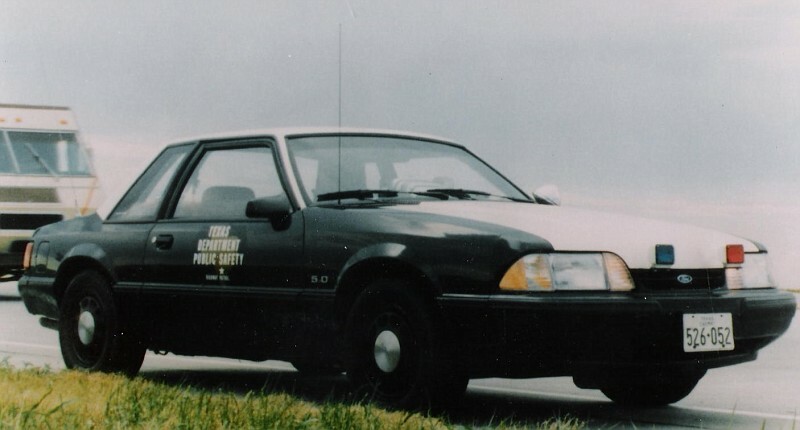 1985 DPS Mustang, with the "SHO-ME" style halogens up front. Image courtesy of R. Collins. 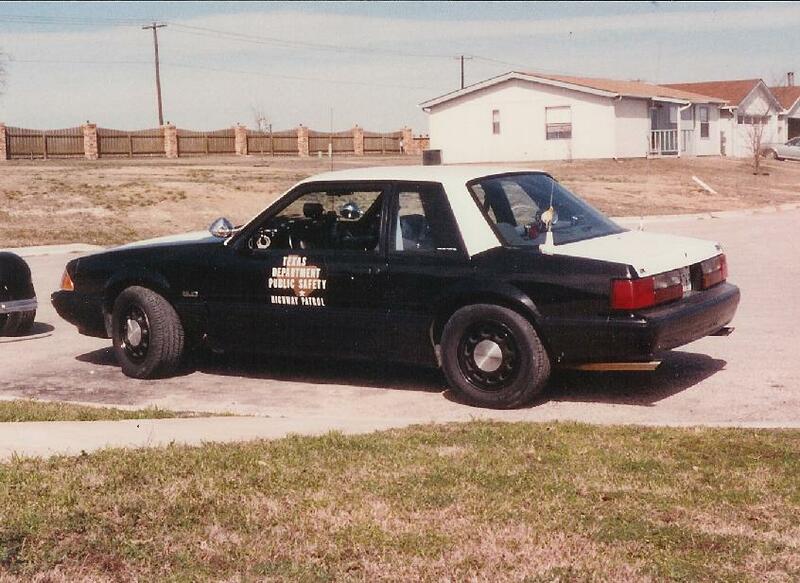 Another 1985 DPS Mustang. Image courtesy of R. Collins. 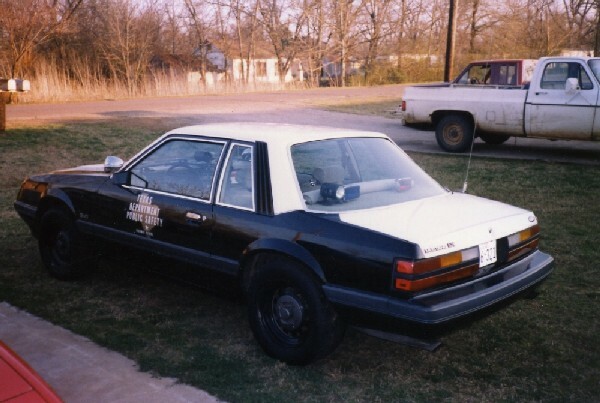 Another 1985 DPS Mustang, showing the rear deck halogens, rear radar antenna, and decibel products antenna. Image courtesy of R. Collins. 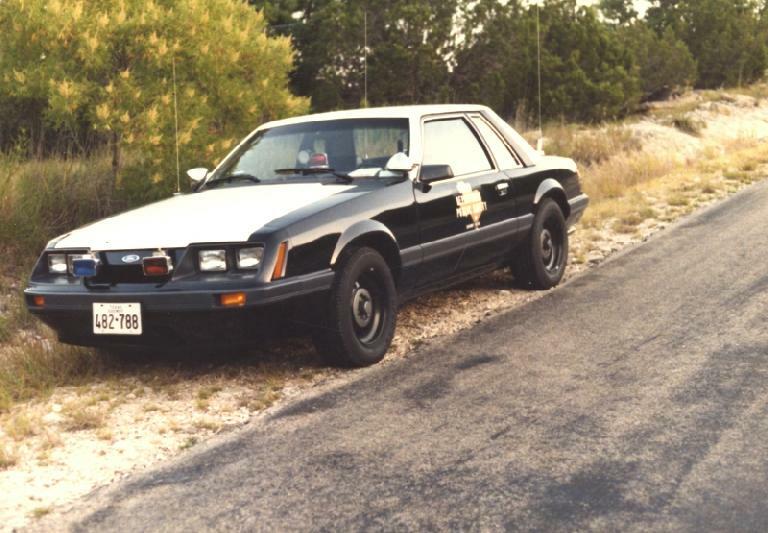 A 1987 DPS Mustang, with the newer Whelen Grillmaster strobes. 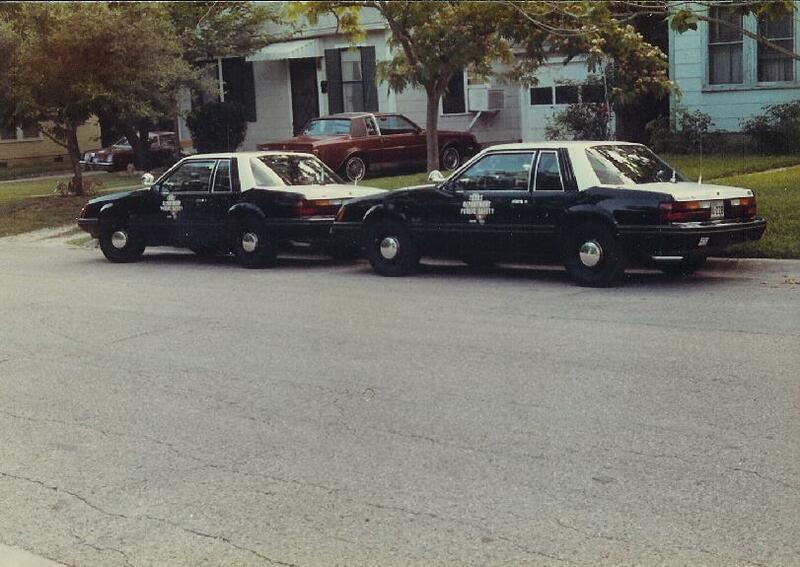 1987s were run with one spotlight instead of two. 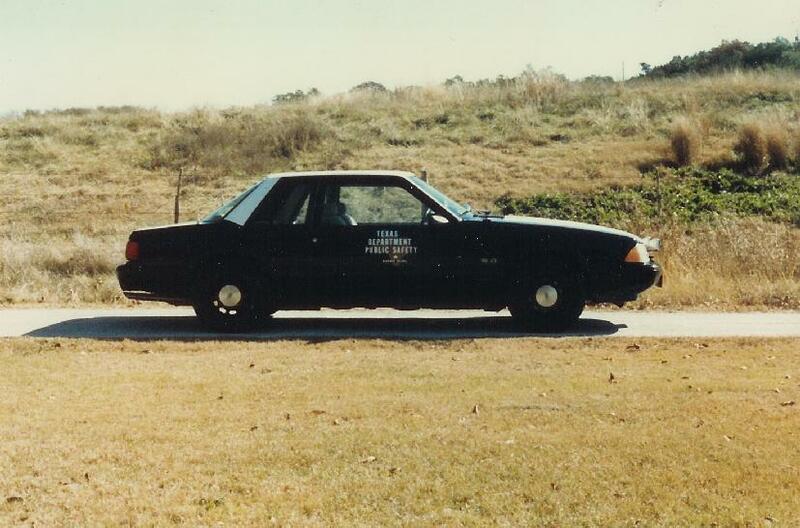 1987 Mustang assigned to Tpr. Pruett. This car had red interior and a single spotlight. Image courtesy of D. Pruett. 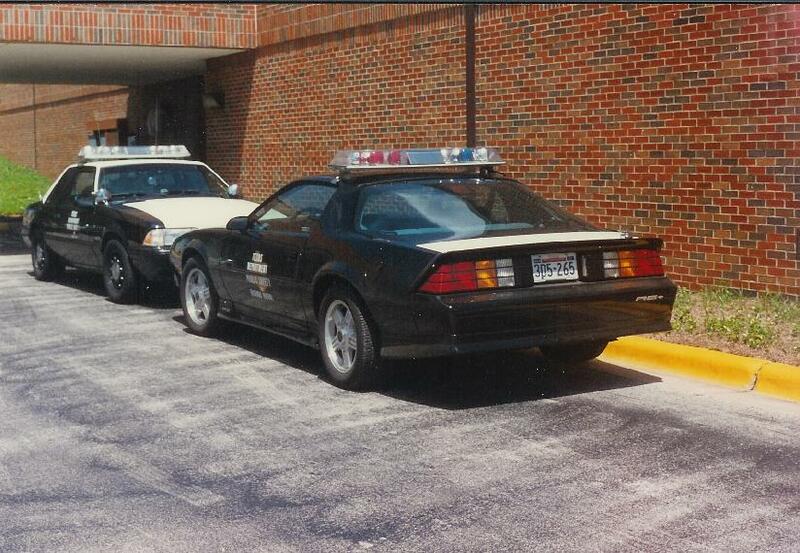 Another shot of the '87 Mustang assigned to Tpr. Pruett. Image courtesy of D. Pruett. 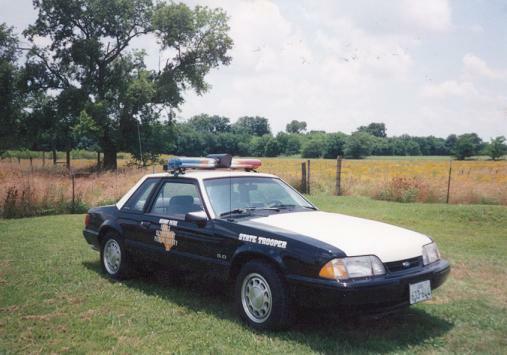 A 1988 DPS Mustang. TX still ran the old halogens on the rear deck with the new strobes up front. Image courtesy of R. Collins. 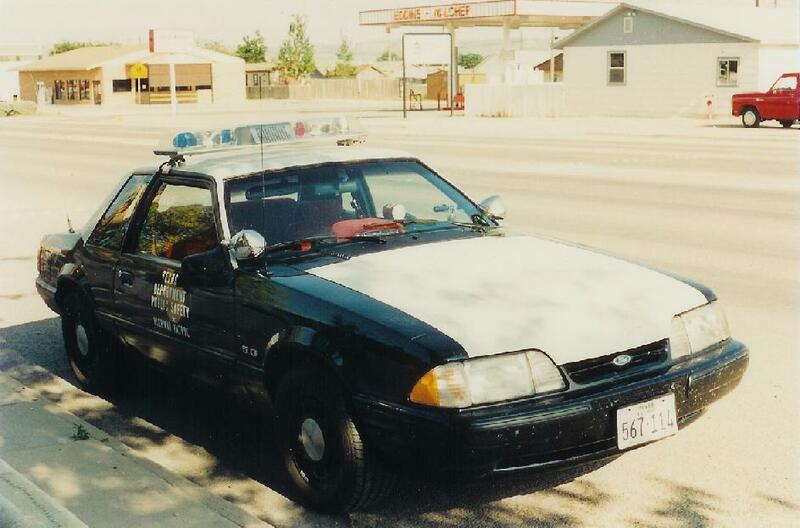 A 1988 or 1989 DPS Mustang with a Code 3 lightbar. 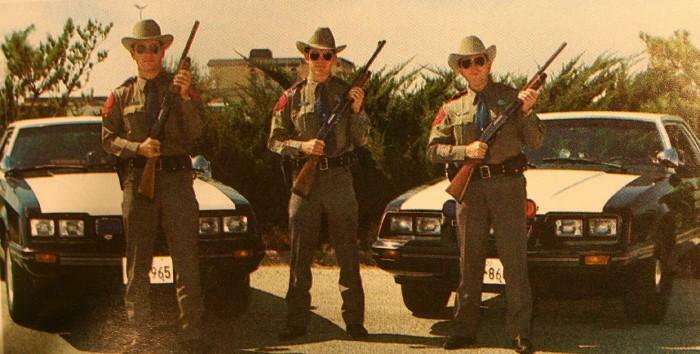 DPS ran mostly slicktops until the 1993s. Image courtesy of R. Collins. 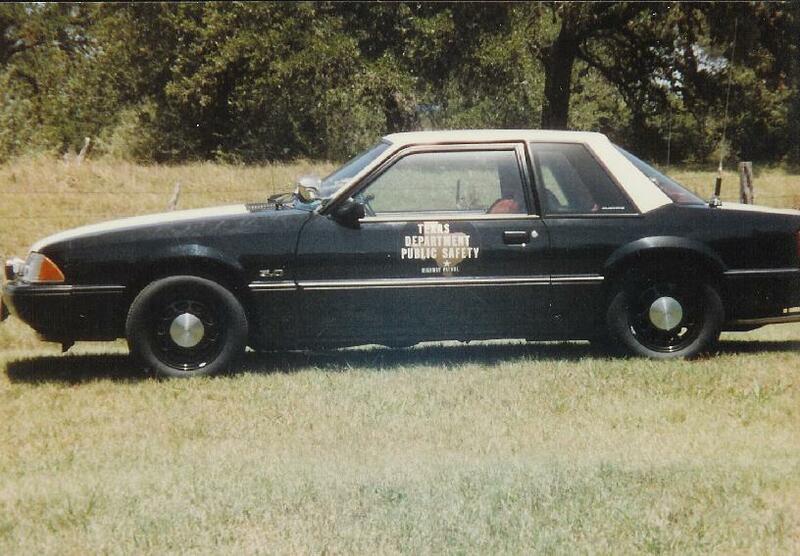 1989 Mustang assigned to Tpr. Pruett. Great underhood shot showing the brackets holding the Whelen strobes. Image courtesy of D. Pruett. 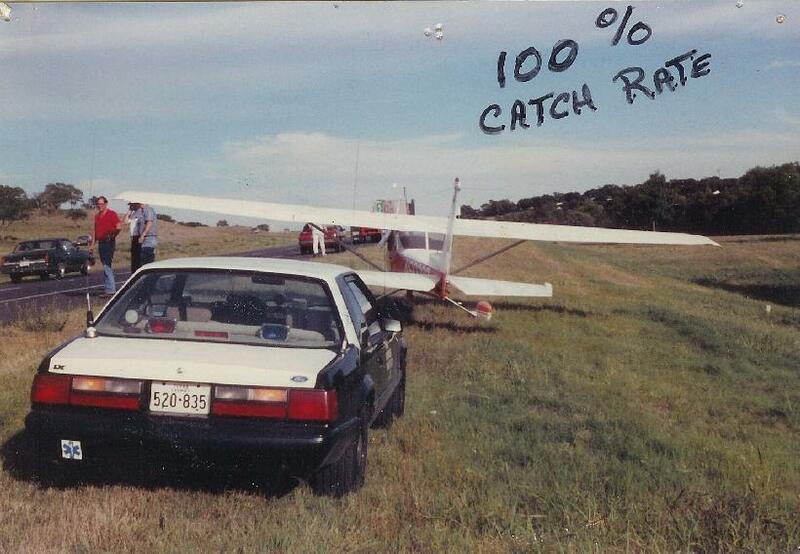 Another picture of the car above. Decatur radar antenna on the rear deck next to the halogen flashers. Image courtesy of D. Pruett. 1989 Mustang and 1991 Camaro. The Camaro was a test vehicle provided by Chevrolet. Image courtesy of D. Pruett. Another shot of the Camaro and Mustang. Image courtesy of D. Pruett. 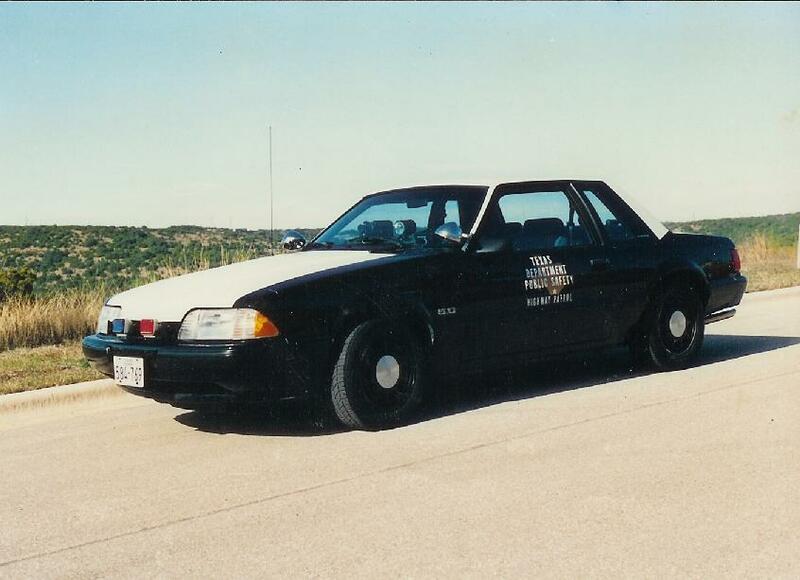 Nice shot of a 1990 DPS Mustang. 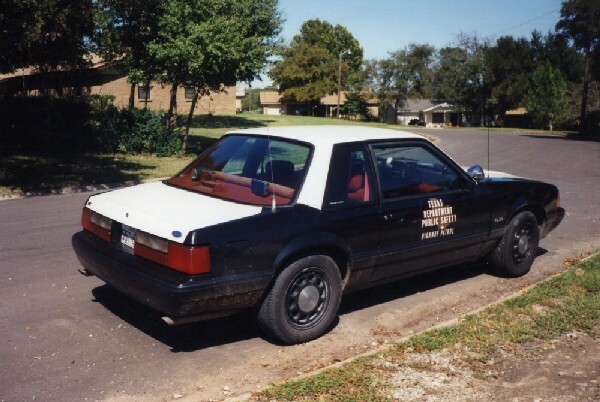 1990 Mustang assigned to Tpr. Pruett. Image courtesy of D. Pruett. 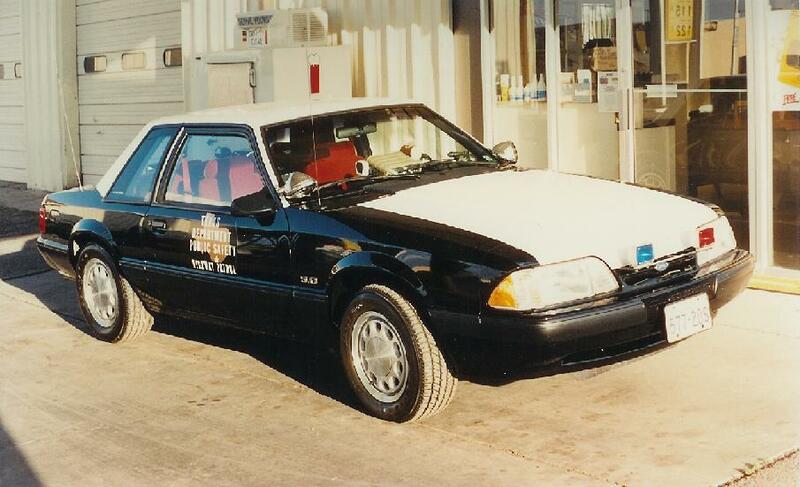 Another picture of the 1990 Mustang assigned to Tpr. Pruett. Image courtesy of D. Pruett. 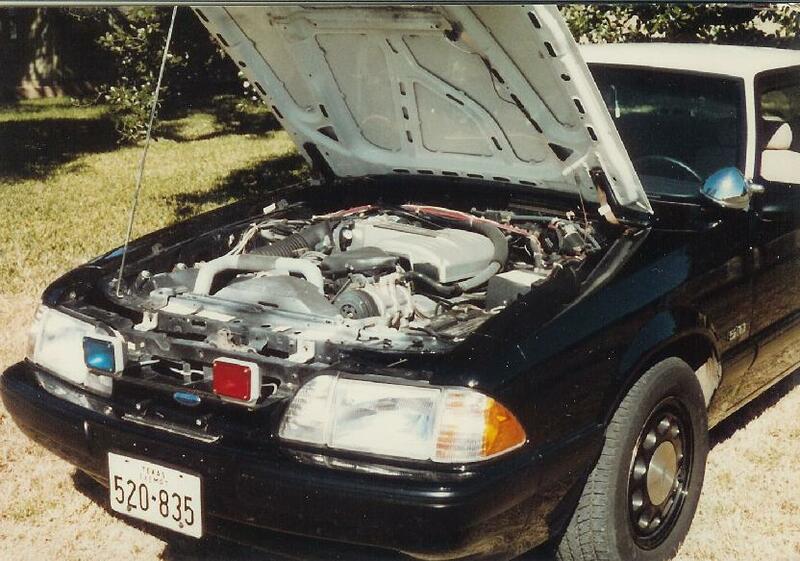 1993 DPS Mustang with a Jetsonic lightbar.Image courtesy of R. Collins. 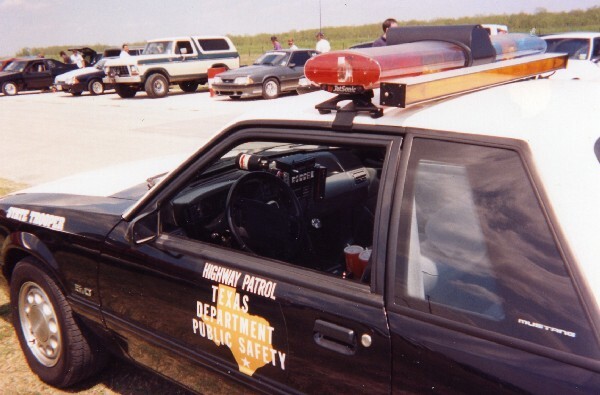 Good shot of the interior of this 1993 DPS Mustang, and of the Code 3 arrowstick. Image courtesy of T. Mallette. 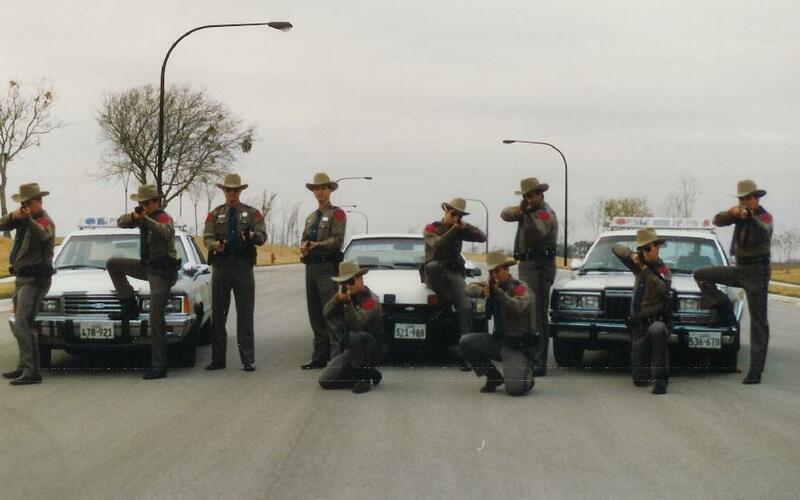 Nice group picture taken in late '80s (unknown year Mustang). The Tpr. assigned to the Mustang was later killed in the line of duty, per Tpr. D. Pruett. Image courtesy of D. Pruett.